Time to Grow a New Set of Antlers! Time to Grow a New Set of Antlers! We believe this young whitetail buck was a fawn last spring. Only male deer have antlers. Some other animals that have antlers are Moose, and Elk. Antlers differ from horns because antlers fall off each year and re-grow the following spring and summer. Horns like on a cow or goat are not lost and continue to grow throughout the life of the animal. 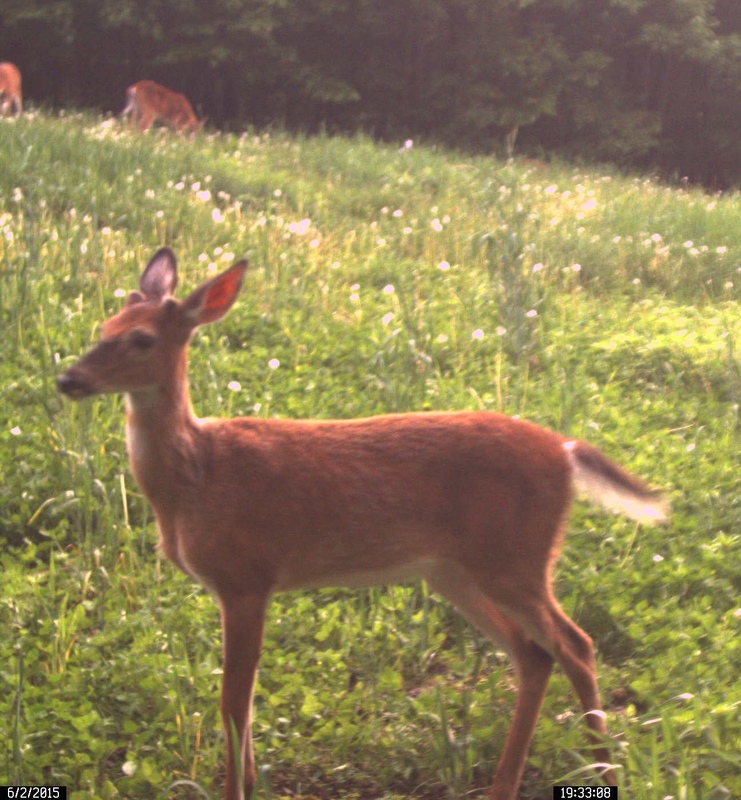 Last year we had several fawns that grew up in front of the camera and we think this is one of them. As you can see this young buck is starting to develop antlers with two “buttons” covered in velvet forming on the top of it’s head. The place where the antler attaches to the base of the skull is called the pedicle. While the antlers are growing they are covered with a hairlike membrane which is is called velvet. The velvet covering supplies a very rich blood supply to the growing antlers. In late summer and early fall, blood ceases to flow to the antlers and the remaining velvet is rubbed off by the deer in time for the breeding season. The antlers are used for fighting other male deer during the breeding season, primarily in late October, November and December. Shortly after the breeding season in January or February the antlers will fall off and are called “sheds”. Then next year the male deer will grow a brand new pair. During the life span of a whitetail deer, which is usually less than 8 years, the antlers will normally grow larger each year until the deer is about 5 years old. For this young buck, his first set of antlers will most likely only grow to be a pair of “spikes” or a small set of antlers. Water Sparingly Water Deep! This is a good idea not just during a drought, but helps plants grow healthier by encouraging the roots to grow deep into the soil and at the same time dry out between waterings. When the roots develop deeply into the soil it helps them access water during dry periods. When the root are allowed to dry out in between water events it helps prevent root diseases. 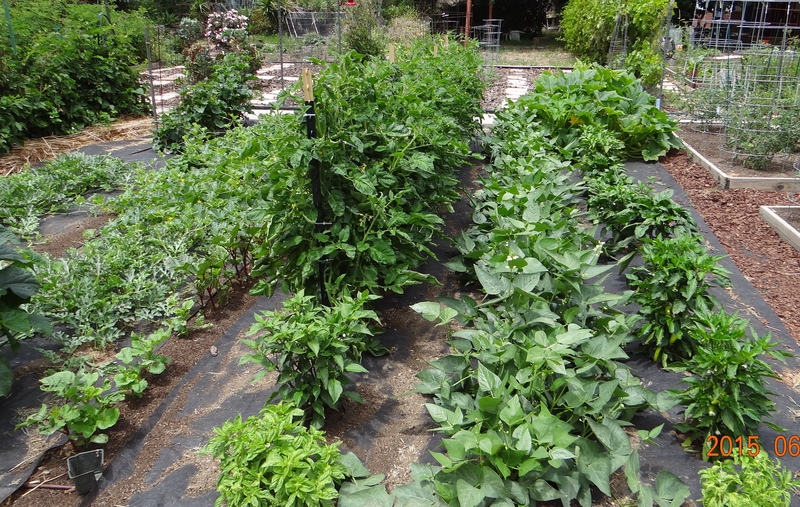 Additionally, less watering prevents the leaching of nitrogen and and other nutrients. Nitrogen contributes to the darker green color that healthy plants maintain. The same is true for lawns and landscape plants. 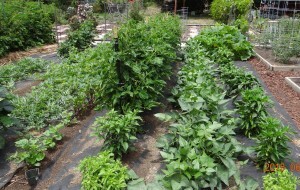 In our garden, where we have a trickle irrigation system and landscape fabric. We are watering at about 5 day intervals and using enough water to penetrate down about a foot into the soil. We adjust the water amount based on natural rainfall, so that if the soil is already moist we delay watering until it is needed. The landscape fabric does “breath”, but reduces water loss at the soil surface. To help us determine when to water next we watch the plants for the first sign of wilting which indicates that the roots cannot pull enough water through the roots to compensate for water lost through the leaves. If it is a warm/hot day and you know you have enough water, then additional watering is not required. In this situation if you want to cool the plants down and reduce the wilting, you can spray the leaves with water just until they are wet and utilize the practice of evaporative cooling. This can be repeated at intervals during the day. This practice is usually not done after 4:00 PM to prevent the plant from going into the night with wet leaves. Wet leaves at night encourages plant leaf and stem diseases.